Their Size & Weight make them ideal for everyday usage, but can their battery hold up to the task? These small, affordable earbuds have great Sound Quality, have an incredible Build Quality with a very high Comfort level. The Battery Life is terrible for most scenarios and Connectivity will occasionally fade, sometimes both ears, sometimes just one. If you intend to use these for short workouts or excursions, they are a great product, but they will definitely be a disappointment to those wanting all-day usage. The Bit Stereo certainly has a very specific purpose: working out. If your intentions with the product match that purpose, then it is a great deal, especially at its often discounted price point. However, if you are looking for a Bluetooth earbud designed to last the day with you, then you will want to look elsewhere. The Battery Life is the Bit Stereo's lone feature that really makes you second guess a purchase, but if your usage is going to stay within the 3 hours, then these are a great value. Just keep in mind that Connectivity can, at times, fade briefly. The design of both the earbuds and the charging case are very well thought out. The earpieces are designed to give some flexibility to the fit, ensuring the Comfort level is as high as possible. The ridged design around the middle of the body gives something to hold on to while placing it in the ear or removing it from the ear. The command button is large enough to be easily hit, but small enough to still look good on the head of the earbud. In addition, there is a good amount of tactile feedback, so that you know, for a fact that you have successfully pressed the button. The charging case is also incredibly well designed. The earbuds fit into the cylinder in such a way that they will not easily fall out or be pulled out while carrying it around. The magnets that hold the earbuds, as well as the two parts of the cylinder, are strong enough to keep them together. The one real disappointment in the design, which is pretty difficult to ignore with the Battery Life issues, is the inability to charge both the earbuds and the case at once. Considering there is no way to find out how much battery life is left on either the earbuds or the charging case, it is very likely that you will end up in a scenario where the case is unexpectedly dead just as the earbuds are dying, as well. Adding some sort of battery indicator to either, or both, or moving the micro USB port to the outside instead of the inside would make this a much better Design. For Bluetooth earbuds, the Bit Stereo sound far above average. A common issue with earbuds in general, but especially Bluetooth earbuds, is a lack of bass and an overabundance of treble. This tends to cause earbuds to be an unpleasant listening experience. This product, however, does not suffer from the overabundance of treble; in fact, the treble levels are about what you would expect. Unfortunately, the bass levels are a little below perfect. This is something that is mostly to be expected, though, as earbuds don't have the length to build bass response in a traditional manner, and Rowkin has not compensated for this. The sound is above average, and is not a limiting factor on the product. As the Bit Stereo are a unique set of headphones, we tested the pairing process across a variety of devices and platforms with surprisingly varied results. The results below are in order of testing. Shortly after unboxing, the product was paired to an iPhone. It took two tries to get the headphones to pair to one another, but on the second try, they paired to the phone immediately. We then used them to listen to Groove Music for about an hour without any real issues. There was a single connection drop to one earbud, but otherwise, they stayed connected consistently and played audio without hesitation. As mentioned in Practical Test 1 of the Battery Life, the second device that was used was a Lumia 635 at the gym. As mentioned in Practical Test 2 of the Battery Life, the third device that was used was a first generation Surface Pro. The pairing process here was incredibly complex and took nearly 30 minutes to complete as the earbuds would not pair to one another properly. As we discovered after some experimentation, the earbuds tend to fair initial pairing if there is a Bluetooth device within range that is already in pairing mode - in this case, the Surface itself. Once the Bluetooth was disabled on the computer, pairing began working, though this limitation is not documented in the included manual. Once the Bit Stereo were successfully paired, they did not hold their connection consistently. About once every 15 minutes, the earbuds would fade out, stay silent for 30-45 seconds, and would then fade back in. At first, because of the nature of the fading, it appeared to be coming from Netflix, but when the issue continued while using Groove Music on the tablet, it became clear the issue was somewhere between the computer and earbuds. Our official battery test was performed on the Lumia 620, so we attempted to pair the earbuds once again. To test the theory about initial pairing, we turned on pairing mode on the phone before trying to connect the earbuds to one another. As expected, the earbuds did not connect. Once pairing mode was disabled, the process was easy, and followed the steps that had worked previously. During the test, we spot checked the headphones to ensure that they are actually playing. In our initial tests, we discovered that the earbuds were silent more often than not. After contacting the company, we were pointed to a reset option, which theoretically resets the earbuds to factory. After this process, and repairing, the earbuds stayed connected more often, though behaved similarly to the Surface Pro - going silent once every 15 minutes for 30-45 seconds. Having only had great success with this one device, we decided to pair it back with the phone to test it again. We had hoped that the earbuds simply worked better with iOS than with Windows, but we were unfortunately met with the same experience as the Surface Pro and Lumia 620: an occasional cut in connectivity every 15 minutes or so. This meant to use that the issue was not with the platform or the devices, but instead with the device itself. We reset the earbuds and repaired the devices again, and were met with the same behavior. The range on the Bit Stereo is surprisingly long. In fact, it is one of the longest ranges we have ever experienced. I tested the range using a paired Microsoft Lumia 650. As a way of testing the range within a real-world scenario, I decided to wear the Bit Stereo while cleaning my apartment. At no point, while sweeping my 3 bedroom apartment, did I lose connectivity for longer than a few seconds, which is a Connectivity issue that exists at close range as well. Bigger, more powerful headphones have not survived the same square footage in the past. Outside, in a direct line of sight test, the earbuds remained connected up to 225 feet. This direct range explains the success indoors, as well, as clearly the transceiver in these earbuds is very powerful. There is a tradeoff with such a strong Range in such a small device: Battery Life. The Battery Life on the Bit Stereo is definitely not its strength. It did not do well on either our formal battery test nor our practical test. Running our formal test on the Bit Stereo, we averaged 3 hours and 10 minutes of playtime, split across three individual tests. The company spokesperson told me to expect 2-3 hours of battery life, so the product absolutely lived up to its advertised expectations. The problem, of course, is that the advertised life expectancy is not acceptable in itself. Another Bluetooth earbud set we are currently reviewing is averaging well over 8 hours, so less than half the battery life for over three times the price is shocking. The product does come with a portable battery charging case, which helps under certain circumstances. If you are using them intermittently, you could place the earbuds in the charging case while not in use. Unfortunately, as you will see in the Practical Test, not all scenarios allow for mid-use charging. One of the intended uses of paired earbuds like these is for use during workouts, so that is where they were tested. During a normal-length personal workout, I decided to pair with my phone and use the Bit Stereo for my whole gym visit. Unlike the other Practical Test, this one was short enough to fall within the battery life of the product. I was able to listen to music and use my Interval Coach app, which speaks during interval training, without losing power. I recently decided to do a full cleaning on my kitchen one night before cooking dinner. Before working, I paired the Bit Stereo to my Surface Pro (documented in Connectivity). Once it finally worked, I decided to play some Netflix content while I worked. During the entire cleaning effort, the earbuds stayed connected and powered. Unfortunately, when I transitioned to cooking, the earbuds ended up dying, so I had to transition to something else. Luckily I had another pair of headphones available to switch to. This was a fairly routine task for which headphones or good speakers are a common accessory. The Bit Stereo were incapable of standing up to the challenge, forcing me to switch to a bigger, heavier pair of headphones, which were less convenient than the small-sized Bit Stereo. Depending on which end of the call you might be on, the Call Quality is very different. If you are the one wearing the Bit Stereo, you will notice that the sound quality is nowhere near what it is while playing music. Everything has a ring to it, sometimes making it hard to understand the other person. The volume is also lower than what would be expected considering the volume of the same earpiece, connected to the same phone while playing music. If you are on the other end of the call, however, the quality is great. In fact, the microphone is of such high quality that you can almost not tell the difference between talking on the phone or using the earpiece. The only quality difference comes from the Noise Cancelation technology, which seems to be using a digital noise gate which is misconfigured, causing the very beginning of each phrase to be lost. All of the controls of the Bit Stereo are contained in a single button on the earbud. In some circumstances, only one of the two will work, while in other scenarios either will work. There are a couple of types of controls that will work on either earbud. First, powering the product on and off can and must be done on both sides. Long-press for 4 seconds to power on or off each earbud, but ideally at the same time. A single press on either side will play or pause the music or other media on the connected device. A quick double press will activate the connected device's Bluetooth command interface, usually Cortana, Siri or OK Google. Unfortunately, phone-related controls are only available on the primary earbud. This is because calls only come through on this earbud, with the other side being silenced. A single press will answer an incoming or end an existing call, while a double press will reject an incoming call. While talking on the phone, I decided to turn on a videogame with constant background noise. The other party was completely unaware of the game before I began speaking, as there was absolutely no sound at all. This is caused by a digital noise gate built into the earpiece. Once I began to speak, and the initial silence was broken, the other party was aware that something was happening, but could not identify the sound. It was masked enough that it was not an annoyance, but not eliminated entirely. The noise gate could be configured a little better to allow the beginning of sentences to not get cut off, but overall, the technology works. There are two main aspects to the learning curve for the Bit Stereo: controls and pairing. As the Controls are fairly simple, there is not a lot to learn. In addition, the scheme is similar to that of other Bluetooth headphones and speakers, so anyone with any Bluetooth audio experience will take to the control scheme quickly. The pairing process, however, is not as simple. The instructions provided in the manual are mostly correct, though they do leave out one important aspect: if there is a device in Bluetooth pairing mode within range, the earbuds may not pair to one another at all, instead seeming to get confused as to which device it is supposed to connect to. This is not a big issue, so long as it is known. With it being omitted from the manual, it makes it a case of discovery to get the earbuds fully paired. The Bit Stereo, like all modern earbuds, come with a small selection of fitted earpieces that fit onto the earbuds themselves. Personally, I often have issues finding an earpiece that fits comfortably, no matter the manufacturer. In fact, I have only found a single piece that has ever fit 100% comfortably, with this product being no exception to the rule. However, the smallest of the earpieces is one of the best fits I have encountered. This is because of the nature of the earbuds themselves. Because of the shape of the electronics, there is a lot of give to the silicon, making it a very customizable fit. The only real issue is caused by the nature of product. Normal earbuds, whether Bluetooth or wired, have cords involved, which allows the wearer to move some of the weight of the product out of the ear canal and on the cable. Because the Bit Stereo has no cord onto which to place some of the excess weight, the weight of the electronics can put a strange amount of strain on the ear, making it uncomfortable under larger amounts of movement, such as exercise. Every aspect of the build of these earbuds, as well as their accessories, is wonderful. 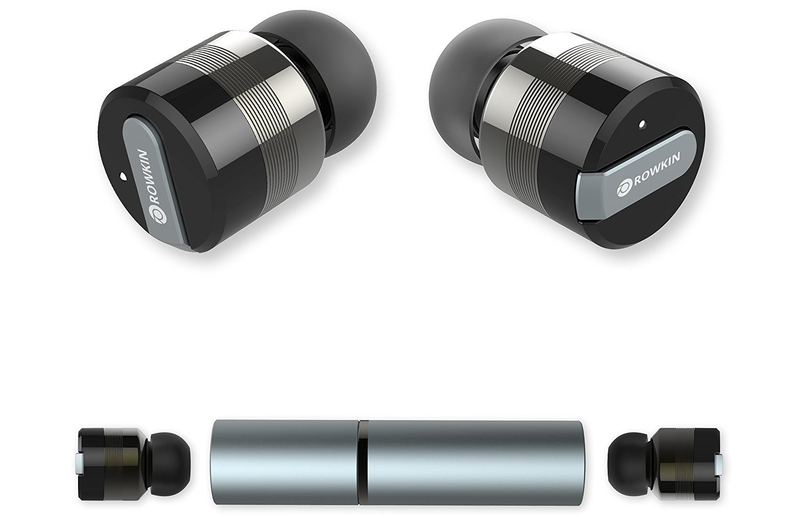 The earbuds themselves are manufactured out of a quality metal, which did not scratch or dent while being carried in both a pocket and a backpack. When they magnetically snap into the charging case, they fit evenly in the tube, without any gap around the earbud. This helps ensure that the earbuds will not get pulled out during transportation. The charging case itself, like the earbuds, was not damaged during transport, either in a pocket or a backpack, with other items. When the two pieces of the case snap together, there is no discernable seam between the two halves, giving nothing for external items to catch on, pulling the charger apart. Based on our experiences, the Functionality of the Bit Stereo was a mixed bag. Our initial two pairings with a device, an iPhone 6s Plus and Lumia 635, went well. Both devices played music and Netflix audio as expected. There was little to no lag, and the headphones stayed connected, both to one another and to the paired device. Unfortunately, after the first two devices, we were never able to replicate that behavior again. All subsequent pairings, including repairing to the original iPhone, were met with various levels of misbehavior. In some cases we experienced occasional, intermittent audio disconnects. In others, we experienced almost constant audio loss, where the exception was hearing something, not the other way around. Some of the workarounds provided by the company helped, though none of them solved the issues entirely. When it comes to the Size & Weight of the Bit Stereo, there are two different states to consider. First, consider the earbuds themselves: they are small, light weight and fit well. The earbuds are light enough that they do not feel much different from traditional earbuds. They are small enough to be easily carried in a pocket, even the little key pocket in your jeans. Unfortunately, because of the Battery Life, you will likely not be able to take advantage of the incredibly small size. Instead, you will probably be required to carry the earbuds in the accompanying charging case. The case, while technically pretty small, does add a tremendous amount of size to the product based on scale. It will eliminate the key pocket as a carrying option, though it will continue to fit nicely into most other pockets. The Bit Stereo paired with and produced audio from every device we attempted to use it with, though with varying degrees of Functionality. Under all circumstances, all of the features were available on all devices, though not everything worked consistently nor did it remain consistently connected.